Be honest, now. On the final day of the Christmas hols, when you were tidying the last of the festive debris from your handbag or pockets and thinking about your first day back at work, did your heart lighten – or sink? Or was it somewhere in the middle? There are exceptions to every rule, but it’s not generally a good sign if you are either ecstatic or profoundly depressed to be back in the office. Even if you are somewhere in the middle, it’s worth taking some time as you start the new year to decide where you are on the spectrum, and to consider whether making one or more work-related resolutions for the new year might help. If the prospect of returning to the office after the Christmas break made you depressed – or even worse, partly spoilt your holiday – then you have to consider very seriously whether you are in the wrong job. It may not be the nature of the work that’s the problem, but a boss with whom you just can’t get on, or a manager with unrealistic expectations. You may simply have been doing the same job for too long, and it’s become stale and boring. Everybody needs a new challenge once in a while. If you decide that you really are in the wrong job for you, your New Year resolution could be to plan your exit strategy, rather than simply resolve to “get a new job”. Do you want to move sideways in the firm, to another boss or another department? What would the requirements be for that, and do you need to do some work to meet them? Do you want to move to another firm, and if so are you prepared to travel further if that’s necessary to get the right job for you? Most importantly, have you got a clear idea of what the right job for you would actually look like? If you don’t get this right, there’s a danger of drifting from one just-about-okay job to another, losing a bit more energy and enthusiasm each time. One easy resolution to keep is to write down all the characteristics of the right job for you. At least then, if you decide to job-hunt later in the year, you will recognise a good prospect when you see it! Fortunately, not many people return to work under a cloud of gloom. Most of us come back refreshed, re-energised and raring to go, except ... there’s often a niggling aspect of the job that either gets us down or that we just don’t like, or there are other parts of the job that we really like doing and would like to do more of, if we could just get the opportunity. 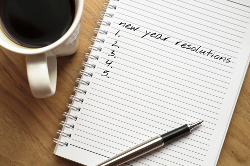 The season of New Year resolutions can be a way of targeting some of those smaller issues. Rather than concentrating on the things you dislike, it’s better to accentuate the positive if you can. Concentrate on improving (and if possible extending) the bits of your job that you really enjoy. Again, a very specific target is helpful: “I’ll take an evening class in business French”, or “I’ll pass a course in Adobe Creative Suite”, for example. You can ask for support from your firm, your line manager or your boss; sometimes even some moral support and understanding from management can make a huge difference in whether or not you achieve your goals. You probably won’t enjoy the dull or repetitive parts of your job any more than you did before, but at least once you’ve finished them, you’ve got something to do that genuinely interests and fulfils you (and may even raise your salary in the long run!). Last but not least, there are those who are positively delighted to get back to work; some of them will have volunteered to work on the days between Christmas and New Year just to get back into the office. There can of course be good and substantial reasons for being exceptionally happy to be back. Sometimes family Christmases can be stressful; sometimes the problem is that there is no family to have Christmas with. But it can be a danger sign if you feel at a loose end and without purpose when you’re away from work. Finding a lot of fulfilment through work is highly desirable; finding all of your fulfilment through work is not. Before things get out of hand, make a resolution that this year you will, at the very least, read some books on the work-life balance and understand why it’s important. The Internet is full of gloomy statistics about how few people actually manage to keep their resolutions, whether they make them at New Year or any other time. They miss the point that just making the resolution is an important step in the right direction. The numbers can be discouraging, but if you keep your resolutions simple, measurable and clear, you can make a big difference in your working life this year.